Less of me; more of God. Not my thoughts, feelings, and experiences; but God's Word alone! This song expresses so much about the desire of every imperfect, saved, and grateful follower of Christ to live the life of an authentic disciple, who wants to mean it when praying, "Thy will be done." The song is called, Word of God, Speak, performed by MercyMe. By the way, Saint Matthew folks, the chorus of this song will serve as our Gospel Verse prior to the the announcement of the Gospel lesson, during the Sundays of Advent. The Contractor Who Does More Than Put Up Buildings! I mentioned here that today I heard a colleague who has frequent contact with the Lutherans in Ethiopia tell two true and inspiring stories of faithfulness from that rapidly growing church body. I told one of the stories in that linked piece. Here's the other one. Several months ago, while in Ethiopia, my colleague met a Lutheran layperson who owns a construction firm. Every time this man and his firm start a project in a community, he also hires two pastors along with all of construction workers he hires for the job. Every morning, before work begins, the pastors conduct a worship service on the site. That sounded great to my colleague. But, he asked, what do they do the rest of the day? The two pastors go into the town and look for people who need help, whether it's prayer or some physical need, and address them. If a group of people comes to believe in Christ through the work of the pastors, after the construction job is completed, the owner will provide one of the pastors pay for one year as the pastor works to get a new congregation started. If any local authorities question this businessperson's practices, he goes to them and hands them a Bible. He tells the authorities, respectfully, that this book will explain why he does the things he does. He asks them to read it and, in a few weeks, if they have any further questions, to get in touch with him for conversation. These conversations, like the visits of the two pastors who work with the construction projects, allow the business owner to tell public officials about Christ. The congregational starts spawned by this man's method receive no financing from the denominational hierarchy, but initially only from one committed Christian who looks for ways to spread the gospel, the good news, of new life for all who repent for sin and believe in Jesus Christ through his business. Not every follower of Christ can bankroll church starts, of course. But we all can be prayerfully on the lookout for ways of spreading the gospel. Learn from the example of this contemporary Ethiopian Lutheran saint: Ask God to help you share Jesus Christ every single day! I heard two true stories from Ethiopia today, both told by a colleague who has frequent contact with the Lutheran body there, the Mekane Yesus Church. The first involved a theologian of the Evangelical Lutheran Church in America (ELCA), the body of which I'm a member and which has wandered so far from God, Christ, and the authority of Scripture. This ELCA theologian was invited to teach a class on the Gospels at an Ethiopian Lutheran seminary. One class was devoted to discussing the miracles of Jesus. The professor told the class of Ethiopian seminarians that his wife had a doctorate in Chemistry and had confidently assured him that it would have been physically impossible to change water to wine, as the Gospel of John says that Jesus did during a wedding in the village of Cana. All the miracles, he went on to say, were added into the New Testament narrative to buttress the first century Church's claims that Jesus is God-enfleshed and Savior of the world. One student wasn't sure that he'd correctly heard the American theologian. So, he asked the visiting professor to repeat what he'd said. The professor did so. The student closed his book and walked out of the class room, as did all the other Ethiopian seminarians. The professor was mystified. This had never happened to him in the States. Soon, the president of the seminary came by to confirm what had happened. He, like the students was offended by the professor's assertion, and asked the professor if he believed in the Trinity, the teaching supported by Scripture that God is one God in three persons: Father, Son, and Holy Spirit. Then why, the seminary president wondered, would he teach something totally contrary to God's revealed truth about the Trinity in the Bible? The doctrine of the Trinity affirms that God the Father is the Creator of the universe, the One Who invented chemistry. The doctrine also says that Jesus is God the Son. If God the Father is Lord over the chemical elements of the universe, how could anyone say that God the Son couldn't be Lord over those same chemicals to perform a miracle which affirmed His identity as God on earth? In too much of the mainline North American churches, we've gotten to the point where we think we're smarter than God and have the right to rescind the clear witness of Scripture. We put too much stock in our own intellects, emotions, and experiences, rather than in what God has revealed through His Word over the centuries. That's why views like that of the ELCA professor who went to Ethiopia are widespread among bishops, pastors, theologians, and even church members in our denomination. To confess that, "Jesus is Lord" is to say that God is greater, wiser, and smarter than I am. To confess that Jesus is Lord is to say that when His revelation conflicts with what I think or feel or have experienced, what God teaches in His Word wins the conflict. Period. End of story. Fortunately, the Church in Africa, Asia, and Latin America is teaching the rest of us who have forgotten what it means to say that Jesus is Lord. Thank God! I pray that all of us in my own Evangelical Lutheran Church in America (and all Christians in North America and western Europe) will learn and live this truth, too. We need to connect to God again! The world needs for us to connect to God again. "Go, tell His disciples and Peter that He [Jesus] is going ahead of you to Galilee..." (Mark 16:7). This has always seemed an apt metaphor for the fact that to follow Jesus doesn't involve nostalgia for the past or propping up old ways of doing things. When you follow Jesus, you can be grateful for what has happened in the past--including Jesus' death and resurrection. You can also learn from the past. But your focus is on Him and the future--both here and now and in eternity--to which Jesus takes those with faith in Him. With a focus on Jesus and the future, we're freed from the endless rehearsal of past failures and hurts. We're free from religion's insistence on reproducing proscribed rites and conditions in order to win God's attention or approval. Instead, Christians bearing their scars and mindful of the lessons of their lives with Christ, learn and grow and move into the great future that belongs to all who follow Christ! Check out these thoughts, today's installment of Our Daily Bread. Obviously, I don't know if all the allegations are true regarding the sexual abuse of eight boys by a former Penn State assistant football coach. There does appear to have been a cover-up of whatever did happen, however. The bottom line is this: There is absolutely no one more destructive or hurtful in the world than a child molester. It cannot be tolerated. If the alleged molestations occurred and anybody in the Penn State administrative or athletic staffs knew about them, prison time would be almost too good an outcome. Nobody in the Penn State athletic program who may have had knowledge of these alleged cases and failed to tell authorities could be said to be any better than child molesters themselves. To abet molesters is to give them a free pass to keep hurting kids. I love sports, but I can only hope and pray that the false deity of sports won't prevent the appropriate working out of justice in this case. Punishing people who have damaged children is a lot more important than a football program! Today, immediately following worship, with the brief service you'll find below, the people of Saint Matthew Lutheran Church prayerfully dedicated a memorial in honor of Sarah Starner, to the glory of God. Sarah died in August, but not before teaching us all so much about living and following Christ. Pastor: Sisters and brothers in Christ, on this All Saints’ Sunday, we seek God’s blessings as we gather with thankfulness for the life and witness of Sarah Starner and set aside this memorial to her, offered to the glory of God. We read responsively Psalm 46, words that have sustained the saints for ages and which sustained Sarah and her family these past years. Congregation: Therefore we will not fear, though the earth should change, though the mountains shake in the heart of the sea; 3though its waters roar and foam, though the mountains tremble with its tumult. Pastor: There is a river whose streams make glad the city of God, the holy habitation of the Most High. Congregation: God is in the midst of the city; it shall not be moved; God will help it when the morning dawns. Pastor: The nations are in an uproar, the kingdoms totter; He utters his voice, the earth melts. Congregation: The Lord of hosts is with us; the God of Jacob is our refuge. Pastor: Come, behold the works of the Lord; see what desolations He has brought on the earth. Congregation: He makes wars cease to the end of the earth; He breaks the bow, and shatters the spear; He burns the shields with fire. Pastor: Blessed are You, O Lord our God, the King of the universe. Your days are without number; a thousand years in Your sight are like yesterday when it is past. You are the Lord of the past, the present, and the future; You hold eternity in the palm of Your hand. We remember with thankfulness all the saints and witnesses to Your goodness who have gone before us, who, by their lives have testified to Your love. Give us grace to follow their examples as Your beloved children, maturing in the likeness of Your Son, our Lord Jesus Christ, by Whose death and resurrection You give eternal hope to all Your saints. Be with us now and bless this memorial, a living reminder of the faith and witness of our sister in Christ, Sarah, who taught and showed us so much about what it means to follow You. As You raised up Your Son, our Lord Jesus Christ, the firstfruits of those who sleep, so also by You Holy Spirit make us to be partakers of that new life which You have promised to those who believe; through Jesus Christ our Lord. Pastor: Let us bless the Lord! Pastor: The blessing of almighty God, the Father, the Son, and the Holy Spirit, be with you all. 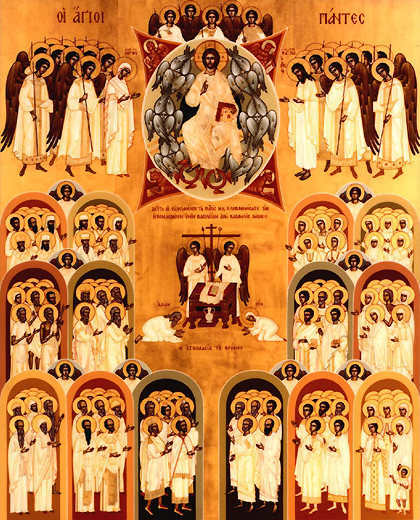 Today is All Saints’ Sunday. But what is a saint? This is an important question. In a real sense, the eternal destinies of every person here today—and every person in the world—depends on the answer. To find the answer, we’ll turn today to the New Testament book of Revelation. That’s where our first lesson comes from. Revelation, you know, is based on a series of visions given to John about sixty years after Jesus’ resurrection, while John was imprisoned for his faith in Jesus. Beginning at chapter 6, John sees Jesus, the second Person of the one God, open the first six of seven seals. With the opening of each seal, each one of which God has been using to hold together this sinful universe and to delay the judgment that must come at God’s selected moment, John sees this creation moving closer to its inevitable end. John also sees glimmers of the new creation that the risen and ascended Jesus will finally and fully usher in when He returns to claim His kingdom from sin, death, and the devil. Jesus’ return will bring celebration and relief to all who have turned from sin and who have believed in Christ. But then, just before the opening of the seventh and final seal, John is allowed to see two scenes in Revelation, chapter 7. Then the numbers of those sealed for salvation are counted out. The total comes to 144,000. Don’t be worried by this number, though! The Bible is not saying that a measly 144,000 people out of all human history will be part of God’s eternal kingdom! For first century Christians, this would have been a number of perfection and completion. The number144 is the total derived from multiplying the 12 tribes of Israel times the 12 apostles Jesus chose to lead the post-resurrection church. For first-century Jews and Christians, tacking thousand onto the back of 144 would be a bit like one of us talking about “a gazillion” in describing the numbers of people shopping at Kroger’s on a Friday evening. Do you know who that multitude from every nation is that John sees in His vision of heaven after the life of this old world has come to an end? They are the descendants of Abram whom God had promised on that starry night so long ago. Everyone who turns from sin and believes in the God we see in Jesus is a descendant of Abraham. They are saints. What gives me the chills when I read the vision Jesus gave to John is the realization that God has never changed. Saints are those who trust God to give them the free gifts that come to all who turn from sin and believe in Jesus: gifts like forgiveness of sin, eternal life, and a sense of purpose. The first two of those words appear at the beginning of verse 9: “After this.” After what, exactly? The great ordeal is something John never saw in the scenes described in Revelation 7. But the great ordeal is something through which every believer in Jesus will go, in big ways and small. Folks, we live in a world filled with beauty and wonder. But with its beauty and wonder marred by human sin, death, and even the suffering of the saints, this world also presents but a glimmer of the beauty and wonder—the perfection—that await all who persevere in following Jesus to the end. After life in this world, the saints who have kept on trusting Jesus, will be met by the Savior, Who will make them clean forever, Who will dry their tears, Who will feed the hungry and give water to the thirsty, and lead them into the new creation for which each of us were made. For now, we live in an in-between time in which, as Paul writes in the New Testament, both we and the whole of creation wait with eager longing for Christ to reveal Himself and His children. Life in this world can be hard. And sometimes, as we’ve noted before, life in this world is made harder because we believe. I am personally convinced that the devil couldn’t care less about tempting or testing those who live their lives without faith in Christ or fear and respect for God. The devil already has them bagged; so, why should he bother them? Instead, the devil tests, tempts, and tries the saints. And every believer in Christ will, eventually, bear the scars—physical, emotional, or relational—that come to those who put following Jesus first in their lives. Our own personal “great ordeals” may include persecution, chronic or fatal illness, disagreements over priorities with those we love or with whom we work, or the internal conflicts that happen within us when a sin tantalizes us and we know that we must choose God’s way and not our own. People who haven’t experienced the biggest break any of us could possibly get—forgiveness and new life through Jesus—have no reason to wonder about the bad breaks life brings them. If you don’t know the God we meet in Jesus, Who is all-powerful and all-loving, the bad breaks of this life aren’t mysterious or baffling. Yet, despite her disappointment and mystification, Karen, an exceedingly intelligent and wise person, persisted in her faith, confident that while the many prayers for her healing weren’t answered in this life, she would, because of her faith in Christ, experience the ultimate healing when she would, in eternity, be with God the Father, Son, and Holy Spirit and with all the saints who, like her, trust in Jesus. And unlike others who endure life’s difficulties without meaning or purpose, the saints on earth, like the saints in heaven, have a purpose: to glorify God and to point to Jesus as our only hope. They’re people who trust their whole lives to Jesus. But they have a purpose in this life: To let the whole world know about the Lamb Jesus, Who will, after the last page has been closed in the last chapter of this world's story, welcome all who have trusted in Him to His new creation. In the meantime, dear saints of God, don’t be afraid! Know His love and power for you even in the midst of life’s greatest ordeals and know for a fact that, like the saints whose names we have read, remembered, and honored this morning, Jesus will welcome you in His heavenly kingdom. He’s eagerly waiting for the moment when you too will join angels and saints in singing and savoring the glories of our loving God and when all who have persistently, perseveringly followed their Savior in this world hear the Lord say to them in the next, “Well done, good and faithful servant!” Amen!